On my second visit as a roving garden reporter to Mona Vale Botanical Gardens in Christchurch, New Zealand, the roses were flowering. In the early summer sun I tried my best to be a serious garden visitor. 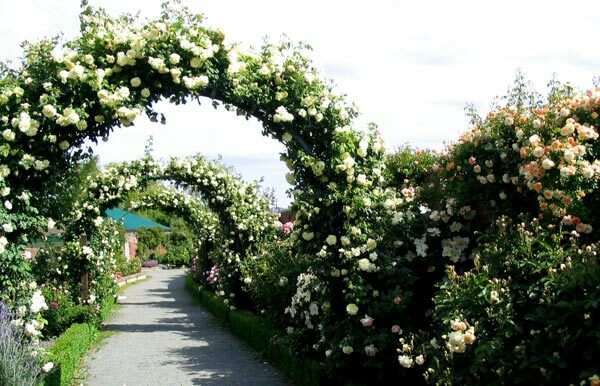 When I visit public rose gardens I usually feel very detached. Of course the flowering displays are lovely, and the compulsory brickwork (archways, walls) makes me envious. But I never seem to make the right connections. And there's something about a garden area restricted to roses that saddens me. I'm sure that the roses themselves would prefer some variety of plant company. I prefer my gardens to be a bit mixed up, even a little confused - with a random element here, an interloper (often self-sown) there. 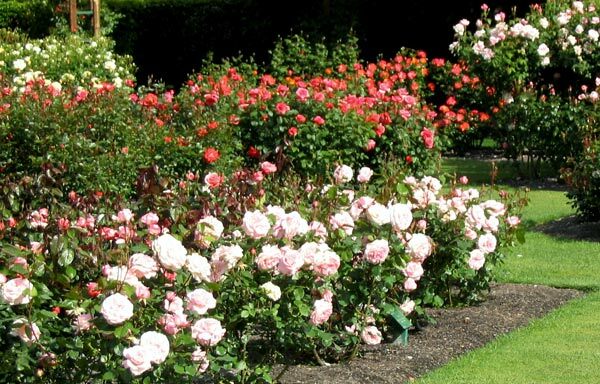 I'm not a huge fan of multiple plantings of the same rose, either - it's rather regimented, and takes all the fun out of playing with colour. 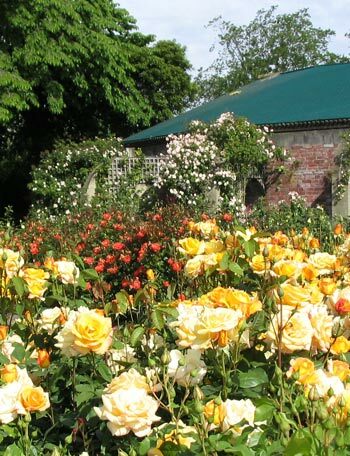 But of course rose gardens like those at Mona Vale Botanical Gardens are worth visiting. One enjoys and admires all the beautiful flowers, and really should take copious notes, or at least take photographs of the labels. Naturally every rose is officially, properly, even artistically named. Public rose gardens always bring out the rebel in me. If the leaf growth is healthy I immediately suspect a daily dose of rose-spraying chemicals. I have no sympathy for blemished blooms. And quite perversely I always end up remembering quite the wrong things. In 1997 I visited Mannington Hall Rose Gardens (in Norfolk, UK). As a colonial gardener I really tried to stay suitably impressed and on task. But my strongest memory is of a stand of normal, humble, everyday red-hot pokers by the lake! Hopeless! At the Mona Vale Rose Gardens I 'oohed' and 'aahed' while my gardening and walking friend promised to remember all the rose names (she didn't). 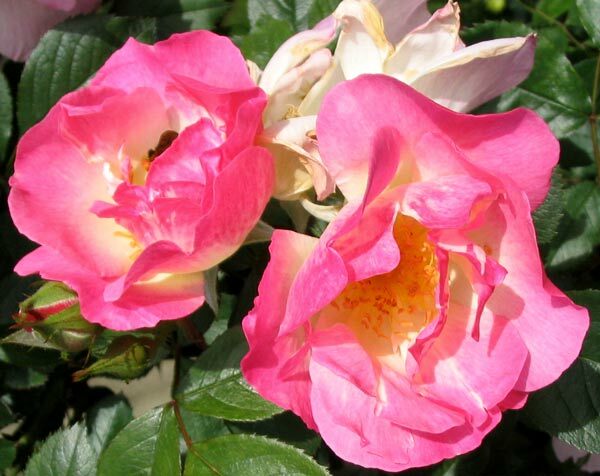 The old-fashioned roses were splendid - once-flowering roses seem to put so much good energy into their flowering season. I saw quite a few David Austin beauties, too - like Constance Spry, one of my personal favourites. The beds of Mona Vale hybrid tea roses in rows were glowing with good health and strong colour. I thought I saw a line of bright yellow Friesia roses. I've got one, a standard - one looks better than lots! 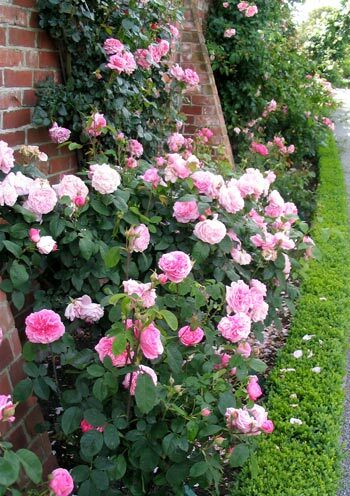 The edges to the rose borders were impressively angled and shovel-sharp, and naturally the lawns were well manicured. But even with the odd well chosen perennial allowed in as ground cover there was something definitely missing. I definitely missed the lavender hedges usually associated with square rose beds.